Hi everyone! Our guided tour was postponed to April, 8th. For more, see below. Hi everyone! On next April, 8th – a saturday, as usual – I am organizing the twentieth-second O RIO QUE O RIO NÃO VÊ guided tour. The visit is called Two Francis and a Martyr. 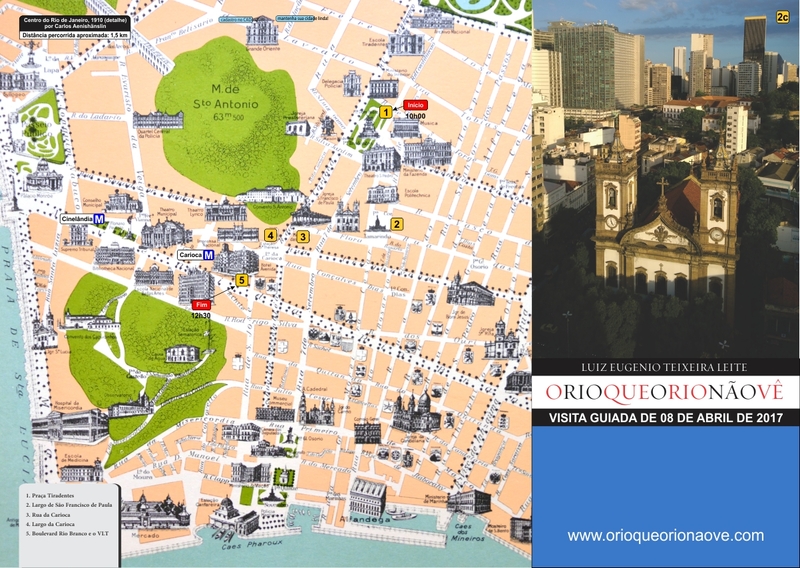 In our itinerary we shall see the João Caetano Theater, the Royal Portuguese Reading Room, the São Francisco de Paula and São Francisco da Penitência Churches, the neoclassical and eclectic buildings of the Carioca Square, the Santo Antonio Convent, the new Boulevard Rio Branco with its brand new VLT and much more. Above is the map. The tour is made by foot. There is no access to the buildings interiors. and still take part of a draw for two autographed O RIO QUE O RIO NÃO VÊ books. The tour begins at 10h, in the Tiradentes Square, and ends around 12h30, near the Carioca Metropolitan Station. The investment is R$ 50,00 (cinquenta reais) and there are 30 available places. To join in it is necessary to make a deposit to the bank account listed below and send the payment proof to leugenio@centroin.com.br until 11h of April, 7th, friday. The confirmation will be sent by e-mail. ← ADIADA A VISITA GUIADA PARA 8 DE ABRIL!